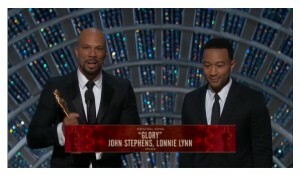 At last night’s Oscars, Southside Chicago’s Common joined John Legend to perform “Glory” from the movie Selma, which was nominated for Best Original Song. Not a soul in the audience was immune to the song’s significance. The movie’s star, David Oyelowo, cried. Actor Chris Pine cried. Amidst the cultural divisiveness that annually is The Oscars, this year included, this moment created an overarching theme that emerged as a reflection of unity – fitting, as we close out Black History Month this week. Following their emotional performance, including a marching chorus and a recreation of the Edmund Pettus Bridge, the duo was honored with the Oscar for their song. What these two did with their acceptance speech was PR Glory. Not only did they maximize their moment of recognition to speak on issues lingering from the era of the Selma march, the message was delivered with conviction, courage and a call for change. While the Oscars are about recognizing Hollywood, it’s refreshing to hear Hollywood voices speak on behalf of cultural causes that impact us all. In the past, the platform and messenger weren’t always the best mix. Best Supporting Actress winner, Patricia Arquette, used her acceptance speech to address women’s rights, drawing impassioned reactions from Meryl Streep and J-Lo. However, as she expanded on her thoughts backstage, her message didn’t echo effectively across all audiences. But, as Common and John Legend demonstrated – making the historical connection to bridge the Civil Rights conversation to the current conversation taking place 50 years after Selma – the right message, right voice, and right platform, provide communicators with the right opportunity, as we saw with Alejandro González Iñárritu’s speech. In the entertainment and marketing industries, life is oftentimes a stage providing us with opportunities to humanize personalities or brands. How we, as the messengers, use these moments to maximize those authentic opportunities matters. « Can your professional and personal passions co-exist?